IT SEEMS obvious by now that the Government's handling of housing issues has been the most successful of several outstanding policy issues. At least, this is going by the results of a recent Straits Times survey on key election issues and their progress since the 2011 General Election. By contrast, government policies on transport issues have yet to resonate. What factors have led to the success in housing policy? What lessons can be applied to transport issues? Three points come to mind. They are: Targeting different social groups more carefully, being relevant, and implementing policies that the targeted groups can readily understand and appreciate. The challenge is to fine-tune policies to meet the needs of different groups more closely. For housing, the different groups included the first-time flat seeker, the sandwiched middle class, singles, and marginalised groups such as single mothers and divorcees with children. For first-time flat seekers, for whom a backlog had already built up, focused policies included building a record number of flats. The move was so successful that within three years, a balance was restored. The average application rate for Build-To-Order (BTO) flats fell from 5.3 per applicant in 2010 to a low of 2.9. A special subsidy was provided for households earning $2,250 or less, with eligible buyers limited to two-room or three-room flats. The Government also expanded its Special Housing Grants to households earning less than $6,500 a month. Applicants could opt for a four-room flat and still qualify for up to $20,000 more in subsidies. There was also the slew of policies related to the rental market, which made it accessible to a wider range of households (and not just lower-income groups). Competition for flats from permanent residents was reduced by making the latter wait for three years after getting their residency. Citizens felt good that they had been given priority. The Housing Board also de-linked new-flat prices from those of resale flats to stabilise BTO flat prices. There was a concerted effort to address the cash-over-valuation component. This was removed completely in the resale market. The move was particularly helpful for young couples, who could take only smaller loans and found it difficult to pay out additional cash. All these measures were announced in quick succession. The cooler market that resulted helped meet citizen expectations. Each group felt attended to, and that created a feel-good, positive attitude. But what about the transport sector? 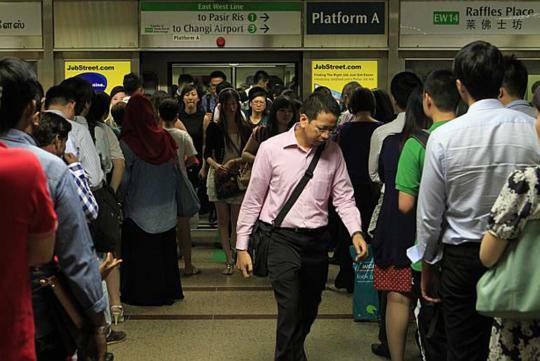 Here, commuters are challenged by overcrowded trains and buses. There is intense competition for road space among cars, buses, taxis, bicycles and pedestrians. Vehicle owners are frustrated with the prices of certificates of entitlement (COEs), which vary with market forces and the growth of the car population. Public anger is compounded when public-listed transport companies report profits, while overcrowding, rail breakdowns and delayed buses are the norm. To be fair, the Government has taken action to improve the situation. It announced several concessions for commuters. Plans are on track to have more trains and to build more lines. Bus commuters will enjoy the $1.1 billion Bus Service Enhancement Programme and efforts to make bus services more regular. For car owners, there will be a review of the carbon emissions-based vehicle scheme. Cyclists will see more bicycle racks to secure 3,000 bicycles at 32 MRT stations. Pedestrians can enjoy more sheltered linkways and lifts at 40 pedestrian overhead bridges. And yet, these excellent, far-reaching policies have made little impression on the public. Why? I believe that unlike in housing, where each measure can be seen to be directly linked to a specific group, transport measures have appeared piecemeal. Transport policymakers must clearly define the various groups they need to address and formulate policies to help each group. Policymakers also need to explain how each set of changes will improve the lot of the various commuters or motorists involved. Take one category of disgruntled commuters: Those who travel by taxi. They want changes to work in their favour immediately. Taxi charges in Singapore are among the most complicated in the world. Surcharges often lead to unintended consequences. The midnight surcharge has led to taxis "disappearing" close to midnight. Surcharges and electronic road pricing charges have kept taxis from the Central Business District, where they are most needed, especially during peak periods. And yet, cabbies complain that they often cruise with their cabs empty. In fact, a solution is nigh. Why not allow and promote the usage of mobile phone taxi-booking apps? Taxi apps offered by third parties like GrabTaxi, Easy Taxi, MoobiTaxi and Uber match cabbies directly with commuters. These apps may appear to be disruptive technology from the point of view of existing taxi companies, which have invested heavily in their call centres. But they cater to taxi commuters' needs. Then, there are public transport commuters. One segment that has been marginalised due to accessibility or high fares are the lower-income, the disabled, the elderly and students. The Government has identified this segment as needing help, and has set aside about $50 million a year for fare concessions. But are these measures enough? Besides incremental gains, there should be transformational policies to bring about the tipping point that was seen in the housing issues. Look for a nexus that resonates. For example, why not use money collected from COEs to support bus and train commuters, and to help meet the needs of special groups like the elderly, students and the disabled? COE quota premiums are a relatively stable source of revenue. For buses, why not allow more private operators like City Direct to operate bus services, to compete with the existing transport companies? Building on the growing public acceptance of transport improvements and concessions, look seriously at structural issues to bring on the kudos from commuters. For now, the policy initiatives have yet to come together in a more impactful way to resonate with people. The writer, a retired public relations professional, teaches media and public policy at the Lee Kuan Yew School of Public Policy, National University of Singapore. The one that provides insightful opinions as well as stories from the daily newspapers. You best believe it.